You know me. I’m always on the hunt for the most weird and offbeat things I can find whenever I travel. 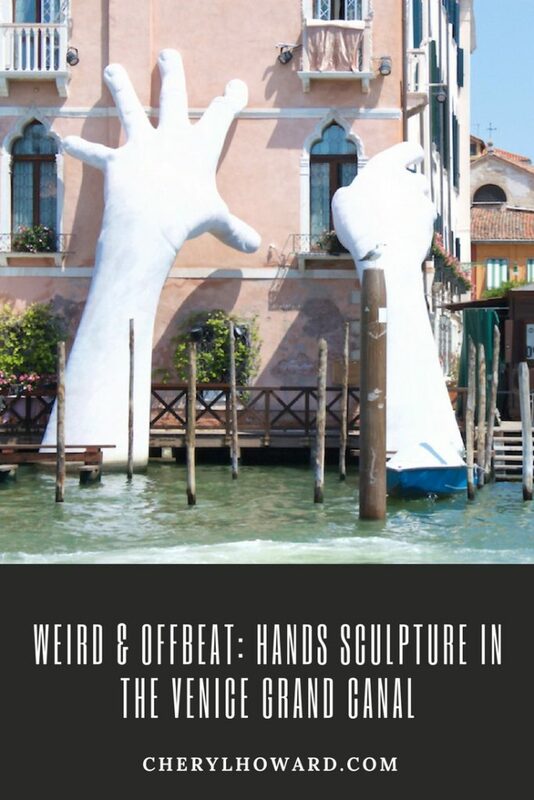 That’s why I was so delighted to spot the giant hands sculpture in the Venice Grand Canal earlier this summer, as well as the quirky bookstore Libreria Acqua Alta. It was a hot and humid Saturday morning in July. I’d left my B&B to set out on my first day of explorations around Venice, which included walking over the Rialto Bridge, perusing the gondolas piled full of books at Libreria Acqua Alta, and having a delicious lunch (which naturally, included a Bellini) at AMO. On my way to the Rialto Bridge, I spied the massive hands sculpture across the canal from the fish market and went into a frenzy, taking loads of pictures, and just staring at the sculpture in wonder. When you first see it, you think “Cool, a pair of hands coming out of the water! My photos of this are going to do well on Instagram.” But of course, I was curious to know much more – what did the sculpture represent and why was it there? 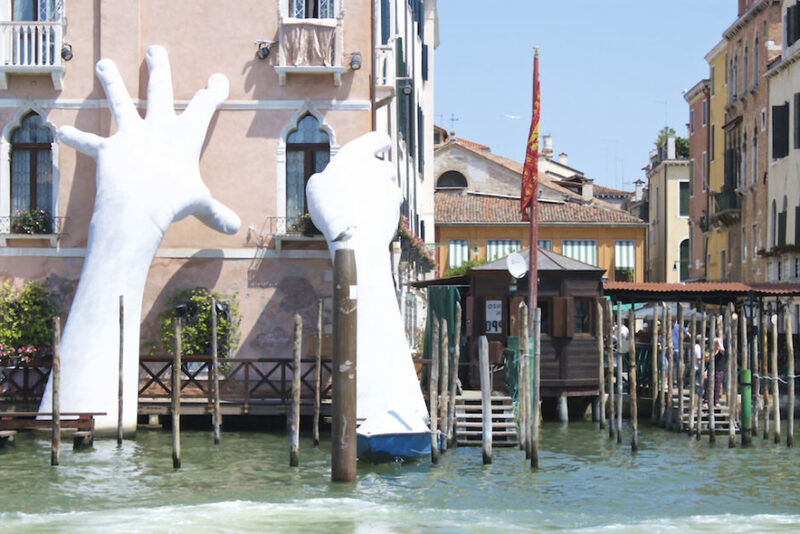 Recommended reading: See what others had to say about the hands sculpture in the Venice Grand Canal, including this article from Bored Panda and this one from the Evening Standard, which includes a video showing how the piece arrived in Venice by boat. Designed by Spanish artist, Lorenzo Quinn, the art installation was created in a collaboration with the City of Venice and London’s Halcyon Gallery. Construction on the piece was completed on May 12, 2017, just in time for the 2017 Venice Biennale. Simply entitled Support, the piece involves a pair of hands protruding from the waters of the Grand Canal. They clutch the side of the Ca’Sagredo Hotel’s 14th century walls, as if they were preventing the hotel from falling apart and sinking into the depths of the canal. At night, it’s lit up by bright spotlights so no one can miss it. While the message is rather bleak, Quinn also encourages us not to despair, as we still possess the power to stop climate change from happening. 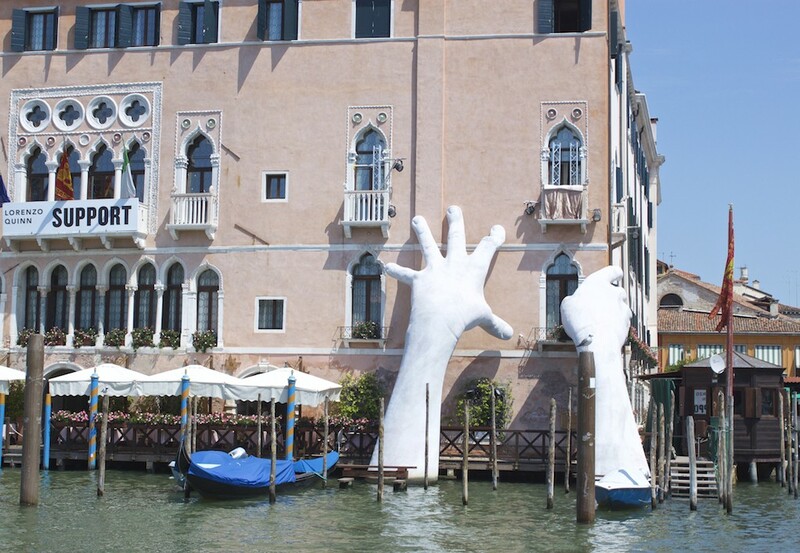 1) If you want to see the hands sculpture in the Venice Grand Canal yourself, it’s not going to be there for much longer. Support will be taken down on November 26, 2017 and will go on tour to other Italian cities, with Pisa being next on the list. 2) If you love all things weird and offbeat, check out some of our favourites posts like this Putin and Trump shotgun street art in Vilnius, the Skull Cathedral in Otranto, and river surfing in Munich. 3) If you’re looking for some Italy travel inspiration, look no further than some of our previous travel pieces. 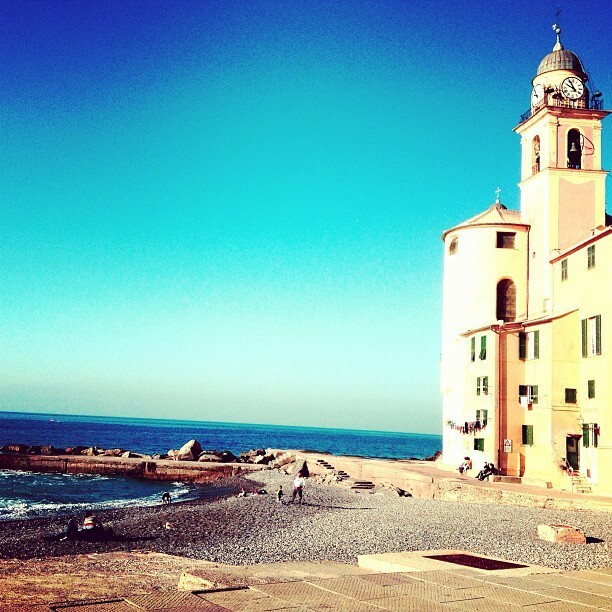 Find out why you should visit Brescia, gaze at Amalfi Coast photos, and experience Porto Venere from the sea. 4) Fellow Canadian travellers, take note. If you’re looking to get a bang for your buck, consider these options for Canadian travel rewards credit cards. 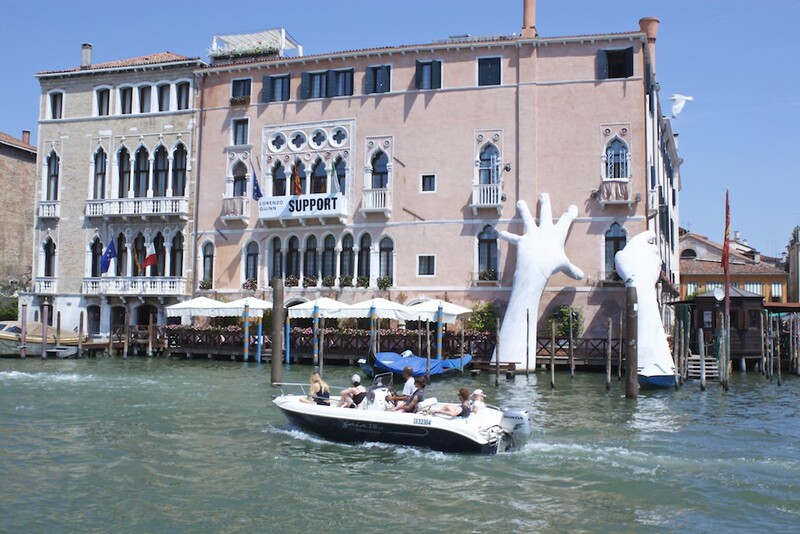 Collect points and book your next flight across the pond to see wonders like the hands sculpture in Venice Grand Canal. If you’re looking for a place to rest your pretty head in Venice, check out your options on booking.com. *Disclosure – In order to provide fun information about weird and offbeat sites around the world, I collaborated with LowestRates.ca. As always, any opinions expressed here are entirely my own. 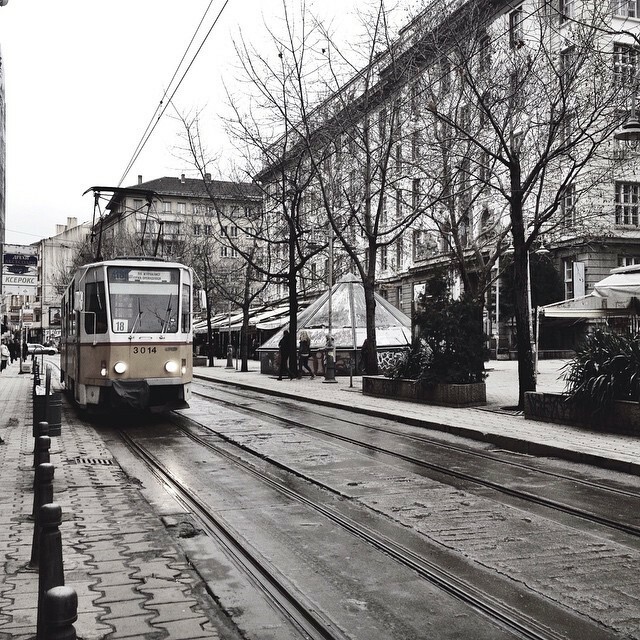 Instagram Postcards Of Berlin – Jul 2012 Edition. Yes, the art installation is a great statement, especially in Venice! But I like that it will be going on tour to other cities so even more people will see it and hopefully be provoked enough to try and make a difference. Thank you. I hope the sculpture will help wake some people up about climate change.